Surfkeepit is the PUP that uses misleading techniques to prevent removal. Use Reimage to locate malicious components and get rid of them faster than with uninstall instructions. A full system scan blocks virus reappearance and prevents traffic to malicious domains. How can Surfkeepit hijack my computer? Surfkeepit (also known as Surf&Keepit) is a deceptive application that may get installed without user's permission asked. In addition, it may also cause various ads, banners and similar notifications what has consequently made security experts label this program as an adware or a potentially unwanted program (PUP). 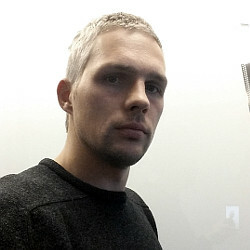 Besides, this browser add-on finds its way to people's computers without their direct permission asked, so you may not notice its presence at first. If you have already noticed this program running on it, keep in mind that Surfkeepit was created with an intention to drive visitor's traffic to affiliate websites and earn money for its developers. Its operation principle is very similar to lots of other adware-type programs, including PriceLess, LookThisUp, Newzio and many other apps that have already been described in our blog. The first sign showing that Surfkeepit virus is hiding in your computer is the reduced performance of your browser. You may notice that web pages load slower than they normally do. Moreover, whichever browser you decide use, Google Chrome, Mozilla Firefox, Internet Explorer or any other, you may noticed that it's flooded with commercial advertisements. Typically these ads tout legitimate products and try to seduce people purchase them. However, if your PC's security is an important issue to you, it is better not to click on pop-ups or banners caused by this program. By clicking on them, you may be redirected to dangerous pages created by hackers and end up with adwares, rootkits and other viruses. Finally, if you have Surfkeepit on your computer, you should know that it might monitor your browsing activities. 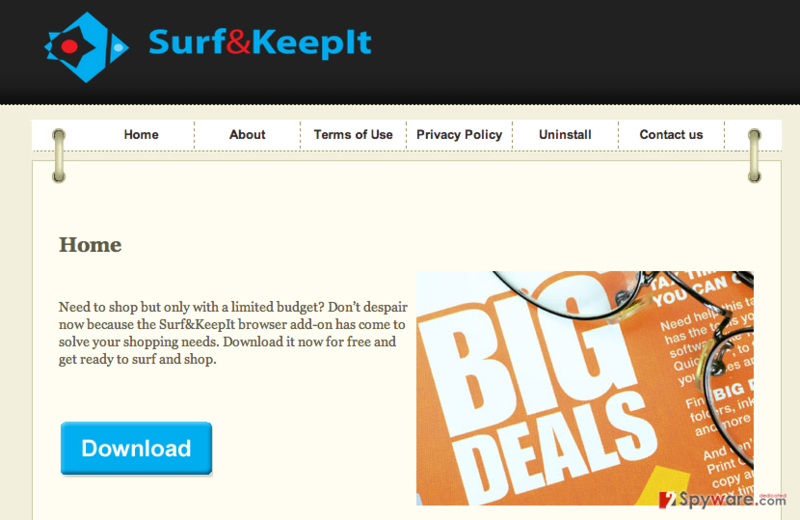 Surfkeepit is usually spread bundled with various freewares and sharewares. It mostly hijacks Google Chrome, but it doesn't mean that it is not compatible with the other web browsers. Such and similar adwares can be constantly updated in order to change one or another feature. Typically, Surfkeepit plug-in is installed together with various popular updates; therefore, it is advisable to examine the programs that you are going to install closely. 'Bundling' is an extremely deceptive distribution method that is not illegal, therefore, marketing developers employ this strategy frequently. Many download websites accept to integrate various third party advertisements as additional component and distribute them in one pack with free software. The only way to prevent constant installation of potentially unwanted programs is to take installation process more seriously. Typically users are notified that the program they want is in a bundle. However, majority of Internet users prefer Quick installation, which automatically installs additional tools, such as browser extensions or toolbars. Choosing Advanced installation option and inspecting every notification of installation wizard would certainly help. You would be able to see notifications that suggest 'recommended installers' and decline them. We highly recommend to follow these simple tips and protect your computer from further adware infections. If you are reading this article, probably your PC got infiltrated with Surfkeepit virus. If this is the case, do not wait longer and delete this threat from the system immediately. Although it might seem harmless, Surfkeepit redirects and ads may pose risk to you and your computer. Therefore, it is advisable to eliminate it. Follow the instructions submitted by our security experts and remove this PUP successfully. Here, look for Surfkeepit or any other recently installed suspicious programs. Wait until you see Applications folder and look for Surfkeepit or any other suspicious programs on it. Now right click on every of such entries and select Move to Trash. When in the new window, check Delete personal settings and select Reset again to complete Surfkeepit removal. Once these steps are finished, Surfkeepit should be removed from your Microsoft Edge browser. Here, select Surfkeepit and other questionable plugins. Click Remove to delete these entries. Now you will see Reset Firefox to its default state message with Reset Firefox button. Click this button for several times and complete Surfkeepit removal. Here, select Surfkeepit and other malicious plugins and select trash icon to delete these entries. Click Reset to confirm this action and complete Surfkeepit removal. Here, select Extensions and look for Surfkeepit or other suspicious entries. Click on the Uninstall button to get rid each of them. Now you will see a detailed dialog window filled with reset options. All of those options are usually checked, but you can specify which of them you want to reset. Click the Reset button to complete Surfkeepit removal process. This entry was posted on 2014-09-12 at 05:23 and is filed under Adware, Viruses. You can quickly scan the QR code with your mobile device and have Surfkeepit virus manual removal instructions right in your pocket. How did you remove Surfkeepit virus?